The town of Hamilton had a social library in 1817 called the Second Social Library. This was a fee-based library and was active until 1853. In 1891 the Free Library of Hamilton, later called the Hamilton Public Library was established. The library moved many times before its final destination at 299 Bay Road. Wenham also had a fee-based library. In 1857 members paid a fee of one dollar to join the Wenham Library Association. The town voted to make the library a public library in 1885. By the 1990’s both libraries needed room for expansion. In March of 1994, concerned residents from both towns formed a committee to investigate how a joint library could be formed. In May of 1995, after another committee had been formed in December, each town voted the appropriate funds to research the feasibility of a joint library. Through the efforts of many citizens, the Hamilton-Wenham Public Library became the first regional library in the state of Massachusetts. It is a magnificent building created through the diligent efforts of visionaries, planners and laborers. 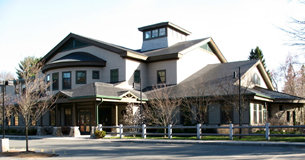 The library was opened in December of 2001 with a consolidated collection comprising the collections of the Wenham Town Library (located at 138 Main St., Wenham) and the Hamilton Public Library (formerly of 299 Bay Rd., Hamilton). The result was a 29,000 square foot, full-service facility with nineteen computers for public use and four meeting rooms. The former high school gymnasium is attached to the library and serves as the Hamilton-Wenham Recreation Center. The adjoining ball field is used by both towns and is extremely popular especially in the spring and fall months. The Hamilton-Wenham Public Library is always filled with activity; it is a welcoming destination to the residents of Hamilton and Wenham and surrounding communities. Visit our Local History page for Local History information.